Have you ever dream of going to camping on the hill to watch the beautiful sky at night? Have you ever want to have a group camping with your family or your friends? If you have that kind of dream, then camping need the tent for you to stay at night. Some of you might find it hard to find the good tent for them to go on camping with their friends or family. In this article, you don’t have to worry about it anymore because we are going to introduce you the top 10 best backpacking tents in 2019. It will guide you to choose the best tents with the best quality and many kinds of tent you would want to choose. The first product that we are going to introduce you is the tent from Luxe Tempo. 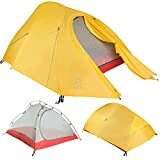 This tent is only 3.3lbs that suit for one person with the bigger body but it can be 2 person tents too for those who have a small body. It comes with shining color which is Bud Green that it fits with those who want to go camping in the forest. The fabric was made from Polyester that made it durable in any kind of weather condition. Moreover, it also has the vents inside the tent that allow the air to go through the tent that provides the comfortable stay. Furthermore, the ceiling inside the tent also equipped with 2 loops for you to put a lamp inside there. Look at the size of the tent, it is 82.6 inches in length, the shoulder length is 37.4 inches and the foot length is 20.5 inches. The footprint also included in the package. You might also be in need of your best companion such as camping cot, air mattress, camping table and wearable sleeping bag as well. The Luxe Tempo is once again on our top 10 list of the best tents. 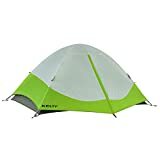 This tent is fit for 2 people and can be used in all kind of seasons. It has two doors that located in front of each other. The inside of this tent is well made from the large panel of 210T that allow the air the flow inside the tent easily as well as for you to breath easily inside the tent too. The design of this tent is to provide you long time user and it is very reliable when it comes to water resistance. Its mesh gear loft can works in many functions not only providing the storage but also help reduce the ray of light to create a comfortable atmosphere. The size of this tent is floor is 55.1 x 82.6 inches, the peak height is 43.4 inches. Moreover, the weight of this tent is 5.7lbs that made it easy to pack for travel. Moving on to number 8 on our list is from Kelty. This is a big tent for 2 people. This venture tent comes with grey mix with light green mix together. It also the best tent for a backpacker to explore outside world. It was designed to contain 2 people also its an ideal tent for backpacker due to its freestanding design. Furthermore, it has a large D door that allows you to easily to go inside and outside this tent. Along the large D door, it also has the storage package inside the tent that enables you to store the stuff inside it. This tent’s dimension is Length: 88 inches, Wield 54 inches and the Height: 43 inches. Its weight is 5lbs and the carry bag already included in the box. Coming up with number 7 on our list is Archer Outdoor Gear. 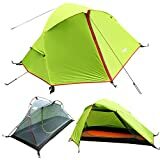 This tent is suitable for Camping, backpacking and it is super light. Not only its super lightweight, this is also waterproof tent since its shell is made from polyester fabric. This fabric will protect you from any kind of weather condition such as rain or even storm. This an one person tent and it is large enough to make you feel comfortable during your stay. The frame poles of this tent are made from sturdy that made it strong and durable for a long period use. Furthermore, it is easy to set up that will take you a very short time to fully installed it. Moving on to number 6 on our list is from WolfWise. 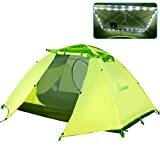 This tent is super light with the weight only 5.07 pounds and the special thing about this tent is its mesh is equipped with a LED light that to use for the canopy. The fabric is made from polyester that made durable and waterproof the ease your burden during your stay. It only takes you a minute to install this tent that saves your time to do anything else. Moreover, you will have a very comfortable stay due to its shelter was made from anti-tear to ensure that you don’t have any burdens. Furthermore, it also has many vents inside the tent that allow the air to go through the tent and allow you to breathe easily. Inside the tent, the roof is USD LED lighting to light up your mood inside the tent. Moving on to number 5 is the tent from ALPS. The fabric of this tent is made from polyester and it is the 3 person tent. It is easy to set up with its freestanding design and two pole design. The poles were made from aluminum that made it durable in any kinds on condition. The two mesh doors of this tent all the air go through the tent as well the wall of this tent is made from mesh too. Inside this tent, you will have a comfortable stay thank those vent from the mesh door and wall. It also has mesh storage pockets for you to store your stuff. The size of this tent is Base Size: 4’10 x 7’4 and the heigh in the center is 38″. Furthermore, it is a super lightweight with only 5 lbs so you can easily bring it along to your next adventure. The number 4 on our best camping tent list is from Bryce. This tent fits for two people with the super lightweight. It suitable for backpacking, kayaking, camping or even bikepacking. Going back to its weight, this the updated version of the previous version that it is 7 oz. lighter than the older version. The zipper of this tent is 2 way, inner and outer. It also features with mesh pockets inside the tent as well as the back vent that allows the air to flow inside the tent easily. This tent is a durable tent since its poles are made from aluminum alloy and the fabric is made from silnylon as well as the footprint. You can bring to the tent to an infinite amount of adventure you go on. The top 3 on our list is once again from ALPS. This is the 1 person tent and it is to install that took you only a minute to finish install it. This tent is durable since it has the aluminum poles that can endure in all kinds of weather. The fabric of the tent is made from polyester that resist with water and UV damage to ease all your burden during your stay. Moreover, it was equipped with storage pocket inside the tent and extra two vestibules for extra storage. 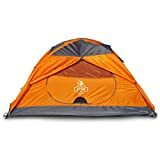 The size of this tent is 5′ x 7’6 for the base, the center height is 46″ with the total weight of 5lbs that you can easily bring it along to any adventures you go on. Another ALPS is one our list again. This tent fits for 2 people and it took only a minute to install. The poles were made of aluminum that made it durable and withstands to any kind of bad weather such as storm or rain. The fabric of the tent is made from polyester that ease your burden from your stay due to its waterproof and resists to UV damage. It features with storage pocket inside the tent, gear loft, stakes, and two zipped window and doorways. The size of this tent is 5′ x 7’6 for the base, its center height is 48″ with the total weight of 7 lbs. Yet again, the ALPS take the top spot on our list. This tent fits for one person and it easy to assemble. The free-standing pole that was made from aluminum made it durable to any kind of weather and took you only a minute to install it. The polyester fabric made it the waterproof tent and an ideal tent to any backpacker and adventurer out there. It equipped with storage pocket, zippers, gear loft and one door. The size of this tent is 2’8 x 7’6 for the base, the center height is 36″ and the total weight is 4lbs. It is super light that you easily bring it along to go on your next adventure. After going through our top 10 best backpacking tents in 2019, we believe that you would have some clues before you buy and pick the best tent amongst all. These 10 tents that we introduced to you earlier are all comes with the best quality and durable to any kind weathers to ease your burden during your stay.